HomeCPE carriage: a rare event in London? CPE carriage: a rare event in London? My old CIDR team have just published a study in JAC reporting a very low rate of carriage of CPE in patient admitted to a hospital in central London (just 5 (0.1%) of 4006 patients). This was a lot lower than we expected! Despite the very low rate of carriage, overseas hospitalisation was a significant risk factor for CPE carriage, and supports that we should be screening patients with recent overseas hospitalisation for CPE carriage. Pretty much every other study on CPE carriage has been on a selected population of some kind (all admissions to high-risk units, or risk-factor stratified admissions). One of the key strengths of this study was the unselected group of patients who were sampled. The study was a clinical trial and required obtaining consent from all patient enrolled. This was a massive operational challenge, and required us to build a temporary team of researchers to approach and consent as many admissions as we could. In the end, we managed to approach around half of the admissions during the study period. But the basic demographics of the patients that were missed were broadly similar to the demographics of the patients that we screened. Patients who were missed were younger and more likely to be emergency admissions, which reflects the way that patients were recruited. We had a real battle with the ethics committee to justify why it was important to include ICU patients without the capacity to consent for themselves in this study (high-risk group, lots of antibiotic use etc); it was surprising that no ICU admissions carried CPE! We had a full-on risk factor analysis lined up, which was scuppered by the very low level of CPE carriage detected. 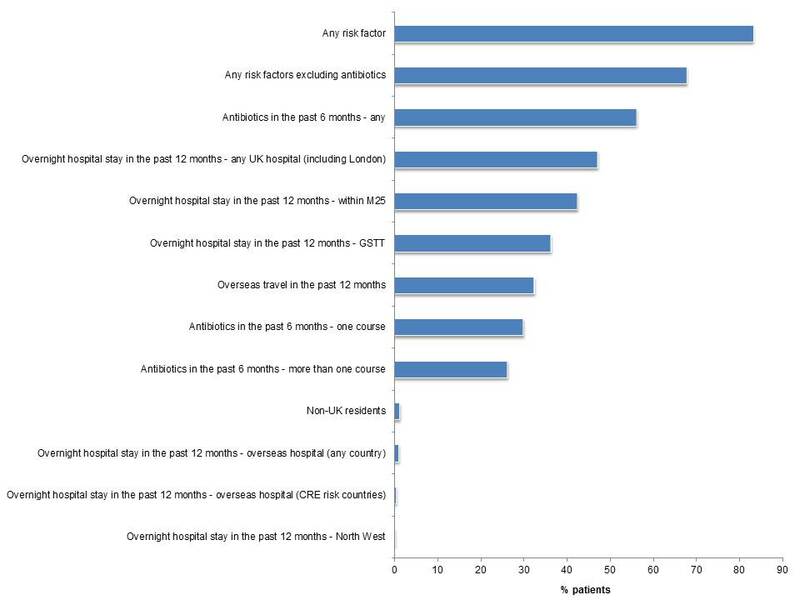 Even with just 5 patients positive for CPE though, overseas hospitalisation was a significant risk factor. Even though the risk factor analysis didn’t come off in the way we’d hoped, the prevalence of risk factors (Figure 1) should prove useful in developing risk-factor based screening strategies for CPE. For example, if you were to use the risk factors defined in the PHE Toolkit to determine who should be screened for CPE, you’d be screening 40% of admissions! Another important aspect of the study was that culture (using two different methods) and PCR were performed in parallel on each specimen. We had expected to see PCR as being more sensitive than culture in picking up the presence of CPE. On the fact of it, this is exactly what we saw, with 76 cultures that were cultured-negative being positive for a carbapenemase by PCR. However, despite sensitive enrichment culture, we failed to grow CPE from any of these samples. Also, almost all of these were negative by PCR when re-tested several months later using a couple of different PCR kits. We thought long and hard about how to interpret this, and concluded that these were likely to be false-positives since we could not culture CPE, the samples reverted to negative by PCR a few months later, there were no significant risk factors associated with a PCR-positive specimen, and some other studies have suggested that the PCR kit we used should be using a higher (i.e. more sensitive) CT value. We need to continue to extend the evidence base around CPE screening: we still have much to learn about who is at risk of carrying CPE, and what is the best screening strategy.